Don't miss our amazing Black Friday Offer, starting TODAY! 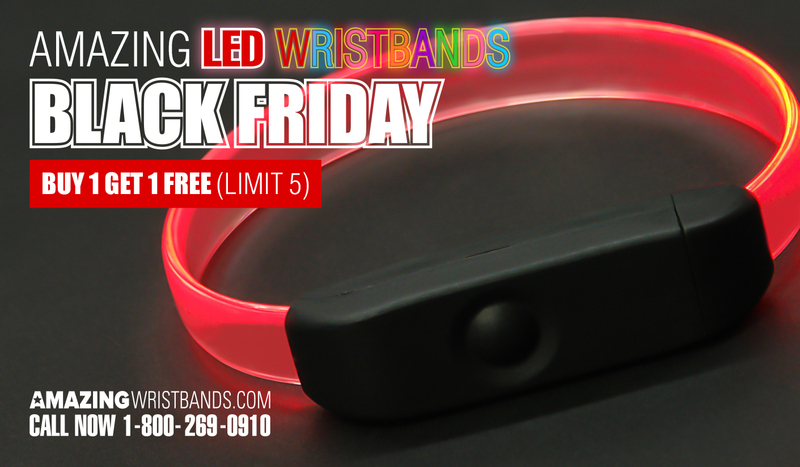 Read on to see how you can easily get two incredible LED wristbands for the price of one! Someone once said that all good things come in twos, and we couldn't agree more. That's why we're giving you every second LED wristband for free! From full stadiums to small meetings, choose our special flashing bracelets allowing the entire crowd to immerse into amazing pixels of light and motion. You can activate each mode by pushing the button on the top of the case. Colors options: We have 8 LED glow colors for you (including multi-color changing) and 7 case colors (including transparent). 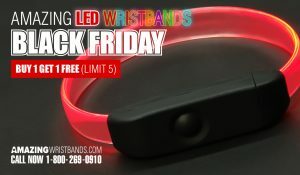 Our favorite Sound/Vibration Activated LED Wristbands are literally lighting up the crowd, flashing to the beat of your favorite tune. They just love speakers’ vibration—performing quite well as a motion activated flash if there is enough movement/vibration to trigger the LED sensor—that’s why they kick so easily into the pattern and light up the crowd into brand new levels of excitement. The LED sensor is turned on/off with a simple switch located on the side of the case. Color options: We have 7 LED glow colors and 4 case colors including transparent, which allows the LED glow color to illuminate the whole case. Yes, we use ultra-bright LED Material: TPU flat optical fiber, ABS switch box power supplied by 2x CR1220 button cells (included). You can add a Repair/Battery Replacement kit to your order but don’t forget this whole offer is applicable only 5 times per user. Enhance any experience like never before with the incredible LED effect, turning your event into a magical light and sound show! Or use our website to send us a message to tell us as much as possible about what you want to convey on your wristbands. This will help our experts so we can best understand your needs. Please include design ideas, colors, etc.